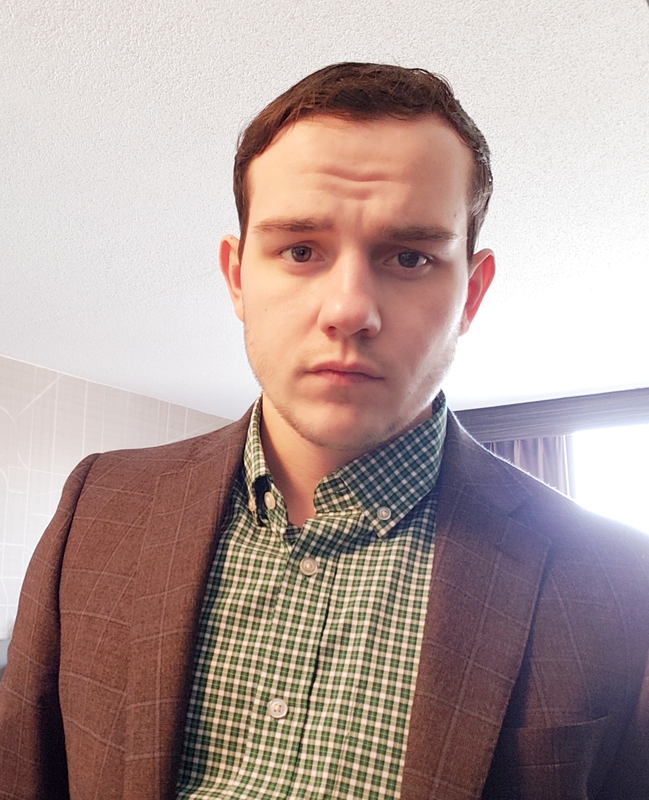 Data loss is defined as data that gets misplaced, removed without authorization, leaked outside of the organization or otherwise corrupted perhaps due to malware. Failure to prevent data from being ‘lost’ can result in hefty fines, especially for organizations that have to comply with the General Data Protection Regulations (GDPR) where they can be fined up to 20 million Euros, or 4% of annual, worldwide turnover. 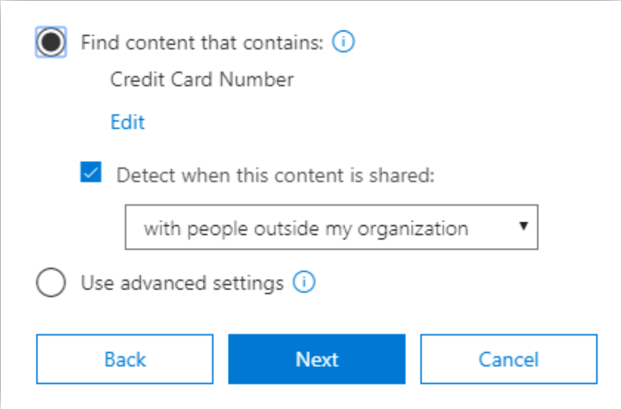 In this guide, I will show you how you can leverage Microsoft Office 365 Security and Compliance center to use labels or tags to categorize sensitive content and create data loss prevention (DLP) policies to control and monitor what happens with your sensitive data. Properly configuring these content labels and DLP policies can significantly strengthen your data loss efforts and help avoid hefty fines associated with failing to meet compliance standards. Classify – Familiarize yourself with the sensitive information types and create a new one if needed. Identify – Create a label to classify content based on information type. Protect – Create policies which will be enforced when a label is applied manually or automatically to content. 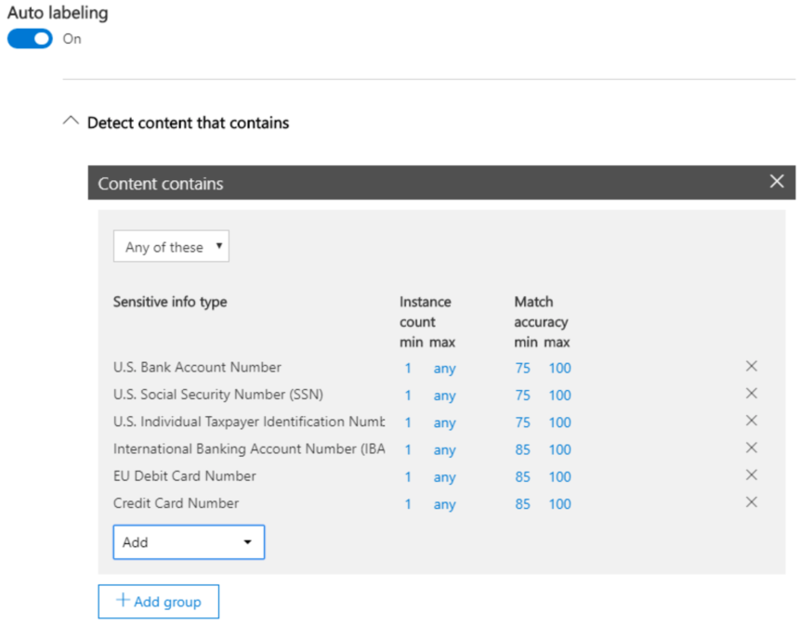 Microsoft has a large collection of default sensitive information types available to use in your security and compliance policies. Depending on what your organization does some of these may already cover your use case, if not you can create a new sensitive info type that correlates to the data you are interested in classifying. First, we’ll create a new sensitive info type, if the default options meet your needs continue to section 2 and we’ll get into creating the policy that will use these labels to classify your content. From the Security & Compliance center expand out Classifications, click Sensitive Info types and create. From the Security & Compliance Center expand out Classifications, click Sensitive Info types and create then choose a name and description. Figure 1.0: Name your label. You can create a custom info type that can be used as a criteria definition for labels, data loss prevention policies and more. Add a supporting element, which is the sensitive info that this info type will look for in content. To increase the accuracy of detection, you can add multiple supporting elements. 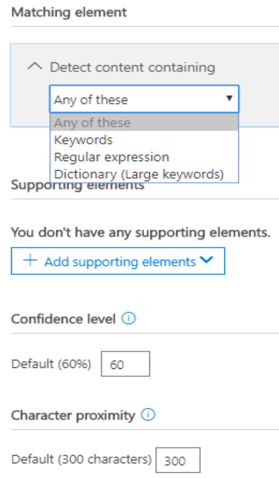 There is a limit for the number of keywords you can add to a supporting element, you can describe a greater number of keywords/patterns with a relatively small regular expression. Figure 1.2: Define your sensitive info type criteria. A GDPR label for example can be applied to content and configured to trigger a DLP policy that blocks the transfer of that data outside of the EU. A retention label can also be created to either retain or delete that content when it reaches a certain age. Step 1: Create a label and name it. 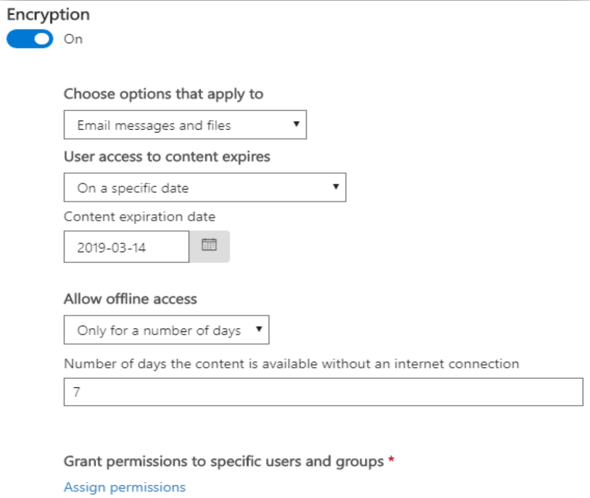 So let’s start off by creating a label, navigate to the Security and Compliance Center from the admin centers list, in the O365 admin center. Expand out Classifications from the options on the left and click Labels –>Create a label. Figure 2.1: Name your label. Step 2: Enable Encryption (Optional) – Turn Encryption on to expose the options in Figure 2.2. Control user access to specific sites – For example, sites labeled internal may only allow access to tenant members. Figure 2.3: Assign permissions to the label. Auto-labeling is only supported in Office apps when the Azure Information Protection unified labeling client has been installed. When sensitive content is detected in email or documents matching the conditions you choose, this label can be configured to be automatically applied or show a message to users recommending they apply it themselves. 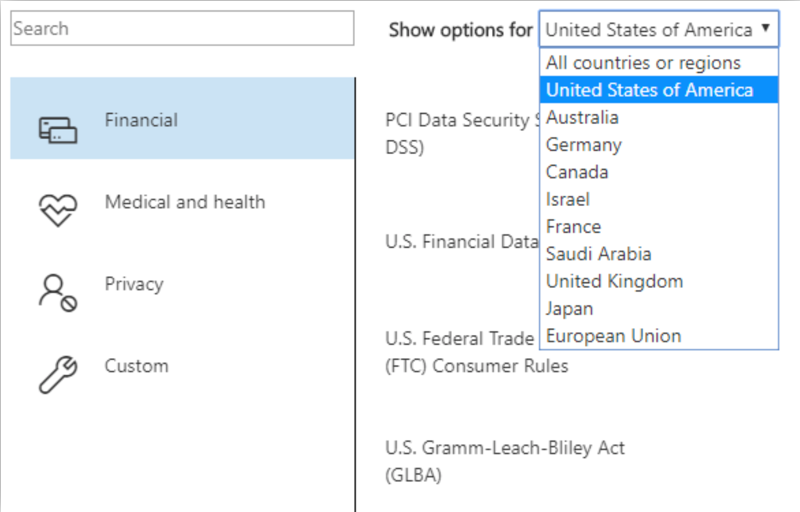 Step 1: From the Security & Compliance center expand out the options underneath Data loss prevention and click Policy. Figure 3.1: Choose a DLP template. Give it a name and description that will help your users understand why the policy was triggered and what they need to do next. After you name your DLP policy you can choose to enforce it in Exchange, SharePoint, OneDrive and teams. 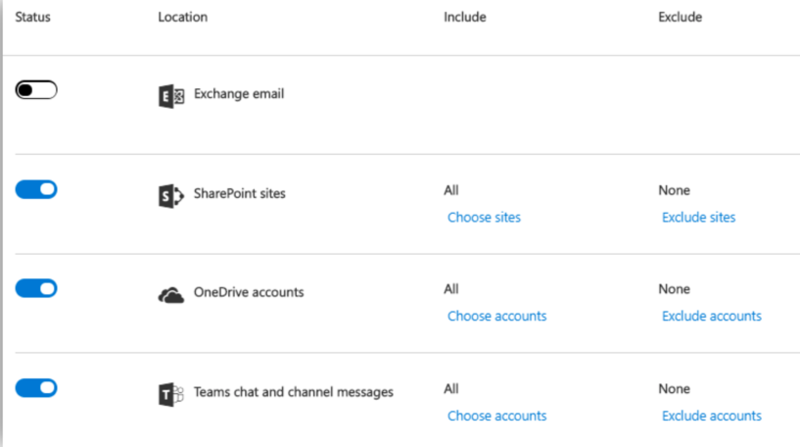 You can also include or exclude Exchange distribution groups, OneDrive accounts, SharePoint sites or Teams chat and channel messages. Figure 1.2: Specify a location to apply the policy. After you’ve chosen where you want to apply your policy configure the criteria your DLP policy will look for. Select ‘Find content that contains’ if you want to quickly set up a policy that protects only sensitive info or labeled content. The edit option allows you to add additional info types to look for as well as the ability to apply retention labels to the content. Use advanced settings for more options, such as protecting content in email messages sent to specific domains, attachments with specific file extensions, and more​. I will cover these in more depth in the next blog post. 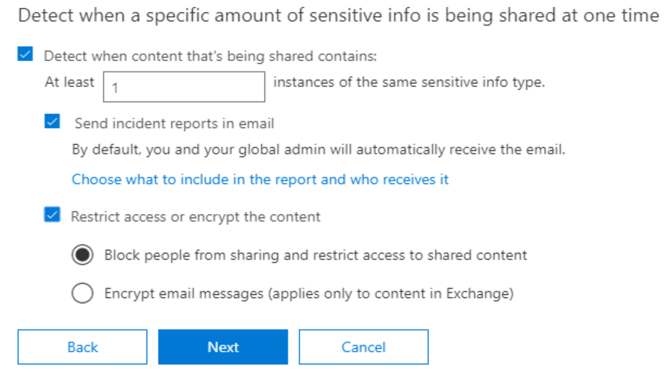 Step 5: Policy settings – What do you want to do if sensitive info is detected? Figure 3.4: Policy settings and actions. Figure 3.5: Restrict access when the policy is triggered. By classifying sensitive info types we can create labels and data loss prevention policies to identify sensitive content and protect it. A sensitive info type or classification is created with supporting elements to define what the sensitive content looks like. A label can be created to leverage sensitive info types to help identify content. A DLP policy contains a location (where the data is stored) and conditions (action O365 has to perform on sensitive data). These policies can be configured to warn users but allow sending anyway with justification, allow them to request approval for sending and allow only internal sharing, etc. It’s important to note that setting up these labels and policies can help with DLP compliance but your organization still needs to be able to prove that it is compliant when audited. This means that your organization needs to be able to audit, report and document how data is stored, accessed and managed. which is best handled with a data access governance solution like StealthAUDIT for SharePoint.